Jewish War. 66-70 CE. Half Shekel, 6.79gg. (11h). Jerusalem, Year 1 = 66/67 CE. 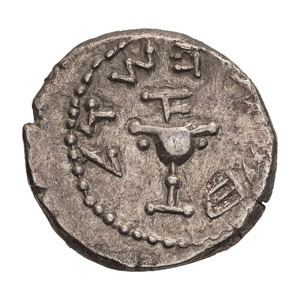 Obv: Paleo-Hebrew "Half Shekel, (Year) One", Ritual chalice with smooth rim, pellet on either side and at middle of stem, flat base with pearled ends. Rx: Paleo-Hebrew "Jerusalem the Holy" around three pomegranate buds on stem with pearl at bottom. Hendin 1355, pl. 33 (same dies). Mint State. NGC 4624985-005. 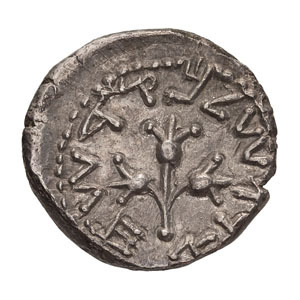 Purchased from Amphora Coins (David Hendin), 27 February 2011.